A preview for my upcoming Mini Theme: The Perils of Greed. As I was writing up this review, more and more connections to other books came to mind, so in the end I decided it needed its own space. Never fear, though, I will link back to it for the Mini Theme. Sadly enough, greed played a huge role in the pollution problem in Tom's River continuing on and on. First off, I really like this cover. The river, plus the water tower in the background--some nice foreshadowing going on there. 3 stars: A lot of good information to process here. When the industrial resins and dye-making company, Ciba-Geigy, first set up their factories in Tom's River, no-one really cared what they did with the waste. Local families were happy for the jobs the company provided, which paid some of the best wages in the area. There was a lot of waste to dispose of, much of it highly toxic, but their operations were surrounded by acres of land. They dug big pits for dumping solid waste, (some of it in barrels, some not) and poured the liquid waste right onto the ground. The sandy soil sucked it up very quickly. Problem solved. Some of it was also put directly into the river, and some was put through a pipeline into the ocean. Over the years, the pollution got into the groundwater and even was pumped into the public water system at one point in the 1980's. Ciba-Geigy and Tom's River Water decided together that the public didn't need to know. After all, it was for a relatively short period of time. Meanwhile, cancer kept cropping up in the area, particularly in children. One mother, whose son had been diagnosed as an infant and who still lived against all odds, even began putting pushpins on a map every time she heard of a new case. She organized a support group for parents of children with cancer, called Oceans of Love. Parents pushed for a government study to prove that there was a cancer cluster happening in Tom's River, and taking it one step further, that pollution from Ciba-Geigy was the culprit. However, it wasn't until a pediatric oncology nurse noticed a strangely large proportion of her patients were from Tom's River, that the wheels started slowly turning for a study. She happened to tell someone who happened to know who go to, and so on. Unfortunately, it would be harder to prove than anyone could have guessed. This one took me quite some time to read. It was quite dense. I was saddened and disgusted by the way those with the power in the manufacturing company consistently put profit margin over health and safety concerns. Also, by the government officials who continually looked the other way, and allowed Ciba-Geigy to police itself in environmental matters, effectively continuing the problem for decades. There were many side forays into various topics, all of which were enlightening, except perhaps the part about statistics. That was just aggravating--as it was for all involved with it at the time, apparently. The evidence of their eyes and experience were pointing to one thing, but it was nearly impossible to get the numbers to "prove" it one way or the other. Yes, deeply frustrating. I will never be a statistician. I can feel my blood pressure going up just thinking about that part of the book again. One other note before moving on: using the word "salvation" in the title was a bit misleading. I'm not certain who Fagin thought were saved. 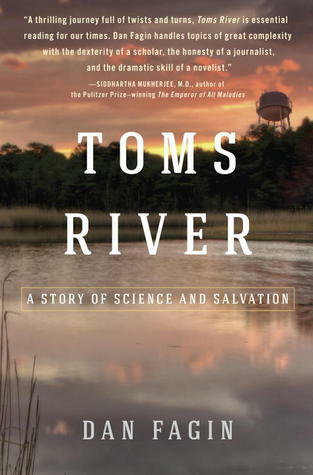 Certainly not the families of Tom's River, unless he was referring to all the activist efforts that eventually got the plant shut down. That area will be dealing with the ramifications of all the toxic waste for years to come. One thing I enjoy about reading this book was that it kept bringing up connections in my mind to other books I've read. So let's talk about those for a moment. Fagin talked quite a bit about cancer, mostly from a historical perspective. He discussed some newer advances and some of the biology behind it as well. 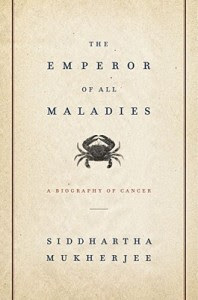 If that part was fascinating to you, you will love The Emperor of All Maladies: A Biography of Cancer, by Siddhartha Mukherjee. Follow the title link for my review of this book, read in June of 2016. Another rabbit trail to follow is the one on epidemiology, or finding the source and cause of infectious diseases in large populations. With cancer this can be particularly difficult (and it doesn't exactly fall under the umbrella of epidemiology anyway as it isn't infectious), but it's roughly the same idea, particularly when it comes to cancers caused by environmental triggers. Interviewing those affected, trying to find similarities, etc. Fagin discussed the basics of the field. If you wanted more examples and case studies, give The Medical Detectives, by Burton Roueche, a try. (Title links to my review from January 2017.) 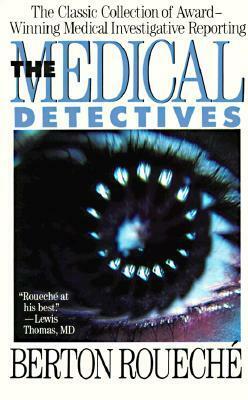 It is all about epidemiologists working out what caused certain clustered bouts of illness. If only those working on the Tom's River cancer cluster case could have found definitive links like in this book. 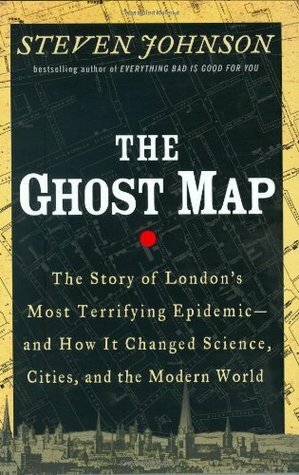 The Ghost Map: The Story of London's Most Terrifying Epidemic--and How It Changed Science, Cities, and the Modern World, by Steven Johnson. 4 stars: This is one our book club read and discussed. I highly recommend it. 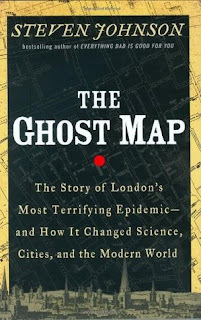 This is the story of London's deadly cholera epidemic of 1854, where more than 700 people died within 2 weeks. But more than that, it is the story of a doctor with an unfailing commitment to figuring out the cause of the outbreak--even though what he finds goes against the prevailing opinions of his time--and a local priest who teams up to help prove it. Johnson then adds an additional layer, weaving the outbreak, and the people involved into a broader historical context. Informative, with lots to think about and discuss. 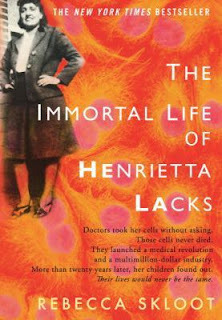 Finally, Fagin mentioned in passing the HeLa cells and how they furthered science. Well, it just so happens that I've read a book about that, too! In the late 1940's a black woman with cancer went to John Hopkins for treatment. Without her knowledge or consent (not at all uncommon at the time) they took a sample of her cancerous cells and attempted to grow them in a test tube. Unlike every other attempt at growing human cells, hers kept growing and multiplying, producing a new generation every 24 hours. Henrietta did not survive her cancer. Her cells, however, didn't just survive--they thrived. Enough so that they were sent all over the world for research and a factory was built simply to produce and ship more HeLa cells to scientists and researchers all over the world. Her family didn't even find out about their mother's cells or their many uses in research for several more years. Skloot spent years researching this book, including the history of the Lacks family, and the nuances of the ethics of cell research. Who has ownership of your cells/blood/tissue samples? If money is involved (and it usually is) who does it belong to? How does all this effect research? Full of interesting questions, clear writing, and a warm look at this family and the way they've struggled with their mother's immortality. Okay, I think that was all the connections. A whole list of good reading to do here, if you're interested! If you do read any of these, let me know! I would love to chat with you about them. These sound really interesting! When Joe was in law school, I read a non fiction book that one of his professors required for a class. 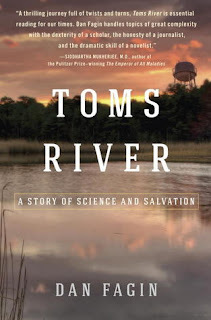 I think it was about this Tom's River story but from the point of view of the lawyer representing the affected people and how the lawyer fought to get the plant shut down. It was heartbreaking to read. These other books sound interesting too! I will have to give them a try. Yes! Let me know if you read any of them and what you thought. End of September: Planting While I Can!